Young Playwrights for Change: Deadline for Registering your Regional Competition is Oct 1! 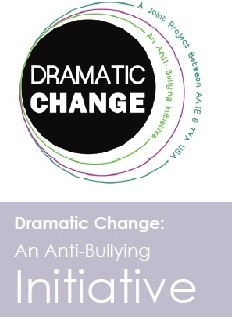 Young Playwrights for Change is the newest program from the Dramatic Change project: an Anti-Bullying Initiative and a joint collaboration of AATE and TYA/USA. — harnessing the power of theatre to encourage respect and community as we fight back against the harmful effects of bullying in the lives of young people. Young Playwrights for Change is a new national middle school contest launching with the 2013-2014 school year with local, state-wide and national competitions. TYA/USA is even exploring exciting funding opportunities to make the prizes and rewards for the national winners even more exciting! Young Playwrights for Change is still looking for other local and regional hosts and it is not too late to join! Registration information and a complete list of rules and guidelines can be found on TYA/USA’s website here. The deadline for signing up to host a regional competition is Oct 1! Each regional competition must send their local winner on to the national competition by Feb 1, 2014. This is also an excellent opportunity to support not just your regional winner but all of your young playwrights in your area. In Omaha, the winning play will be produced in our teens n theater season as part of our Young Playwrights Festival. We will also do rehearsed staged readings of four other winners. These top five young playwrights will then get a scholarship to join our teen Young Playwrights group nex fall. All middle school students who submit will get a feedback on their play from a professional theater artist and get two free tickets to attend our Young Playwrights Festival. We are also awarding the teacher who submits the most plays from their class, a playwriting residency in the classroom next fall. Questions? Email Brian Guehring at briang@rosetheater.org for information on joining the Young Playwrights for Change committee or to get more details on how to host your own regional competition!